Are you looking around for something to do for your AR-15? Or are you building a new AR-15? 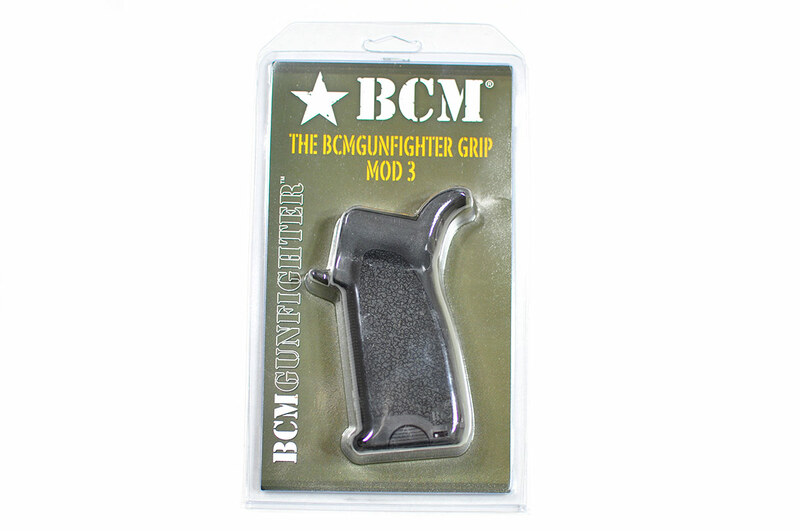 In either case, for the pistol grip, you should check out the Bravo Company Manufacturing (BCM) Gunfighter Mod 3 grip. It definitely makes for a great upgrade to a standard A2 style grip. I recently decided to build out another AR-15… After doing some looking around and having a hard time finding a decent gas piston setup that I wanted, I decided to get another Bravo Company USA (BCM) direct impingement (DI) upper setup. I purchased one a while back and have had nothing but good things to say about it. If you’re not very familiar with KeyMod, it’s been hitting the market hard and fast lately. Every company seems to be coming out with a handguard, or accessories for it. One of the features I like best about it is the weight savings. Since the “keys” are relatively large cutouts, you are able to create light weight mounting solutions, that are still durable, functional and very modular. You can attach accessories that are specifically designed to work with a KeyMod system, or you can attach picatinny (MIL-STD-1913) rails that have a KeyMod attachment on them. So you can still use all of your standard accessories that have picatinny mounts. It’s really the best of both worlds in my opinion. Now that I have the BCM KMR in my hands, it was worth the wait. It’s extremely light and feels great in the hand. I have smaller hands, so the narrow contour of the rail is great. It’s especially nice for using an over the top grip that is becoming more and more common these days. BCM touts the handguard as being made of a light weight and strong blended aluminum and magnesium alloy; they say it weighs “30-40% less than aluminum with the same strength properties”. It also includes an “indexing and lock up system that mitigates 12:00 rail movement under heat generated from the barrel nut.” BCM reports that the handguard assembly weighs in at 7.7oz, with all of the attachment hardware; extremely light for a 13″ rail. The whole assembly, upper receiver and handguard, came in at 2lb 12.5oz on my scale, then after adding the bolt carrier group and charging handle (BCM MOD 3), it weighed in at 3lb 9.5oz. All quite light for a complete upper in my oppinion. The finish on the rail is not an anodizing, it has a kind of powder-coated feel to it. It’s definitely different from most standard rails, but it’s a nice touch and feels good in the hand; it gives it a smooth feel (and no sharp edges). The upper is a standard BCM upper, with the Barrel, Forged, Hammer (BFH) marking added to the upper left side. The BFH denotes that the barrel is hammer forged, opposed to the standard barrel options that BCM also offers. I went with the BFH barrel simply because I wanted to try one out and see how the accuracy is. I have a standard barrel on my other BCM upper, and have not had a single issue with it. Hammer forged barrels are supposed to have a better lifespan, and be better for things like full-auto fire. But for standard usage, you probably wouldn’t notice the difference. So in the vast majority of cases, it’s probably not worth the extra money. Also included with the handguard were two picatinny keymod attachments. They are the Nylon versions of the rials, BCM also makes aluminum versions, one 3″ rail and one 4″ rail. I’m not sure how well the nylon ones will hold up, but they feel really durable and are extremely light weight. So I’ll give them a try and see how they hold up. I’m looking forward to getting this gun finished out, the upper will go nicely on my Coronado Arms lower. I only need couple more parts and then it will be time to get it on the range for some testing! If you are interested in picking up one of the complete uppers or are looking for other BCM parts, the buttons below will take you to the right places.